This Sunday we will celebrate God’s calling of disciples and the calling we can and must do for one another. And,in our diverse congregation we also celebrate the birthday of the modern day prophet, Dr. Martin Luther King,Jr. whose “official” birthday celebration is the next day, the 19th, in the United States. Like Samuel, Andrew and Simon, Dr. King was called to follow the way of Christ and, like Jesus, the Christ, he was called to give everything for love and justice and he called upon others to do the same-and to do it without violence. In I Samuel 3: j10,19 we see the young temple servant, Samuel, sleeping near the Ark of the Covenant oblivious to who is calling him in the night. Each time he answers thinking it is his teacher, Eli. Finally Eli wakes up too and instructs Samuel to respond to God, YHWH, by saying “Yes, YHWH, I am listening”. When Samuel does this at the next call, God gives him a message to convey, the first of many prophetic messages. We note that Eli, who has apparently made some mistakes with his own children according to the fuller text, recognizes the call of God to Samuel and steers him in the right direction. As I reflect on this I think about the children and youth served by our church. I wonder what God is calling each one to be and to do, and I pray that we may, like Eli, and despite our own shortcomings, be instruments of pointing them toward God’s call. I think of Natasha our college freshman who began her first college semester very sure of what she “wanted to be”-a nurse- and what to major in and how quickly she became unsure of all of that. I thought it was good that she became more open to exploring who she is and what she may do and become in life. She was happy to hear this. This choice of life’s paths may be part of call, a part of vocation, part of God letting us know what we can do for the kingdom (kin-dom) but there is more. I remember feeling called by God to love and serve God at an early age. It was about a growing relationship with our loving and living God. I remember trying to figure out my life’s paths as well. The two calls were related but not the same. Both of the beloved Pastors of my youth assured me that I had found my vocation, my calling in social work and social work education and to serve the poor, the different and the homeless and to work with them for their empowerment on all levels of being. Later, the surviving Pastor was to tell me that he agreed that God wanted something more, something different of me in my later years, and he affirmed my calling to become a priest and pastor. Whatever the career or work choices may be, and a lot of that depends on opportunities, and whatever the vocation, God is calling each one of us into relationship and to build the kingdom of love and justice. And, I think about the adults and seniors as well. It is not too late for each one to respond to God’s call although some may feel that they have so little to offer. God gives each one of us something important to do to build the reign of God in love and justice on this earth. We can pray that we can inspire one another to listen for God’s voice in our lives-to hear what each one can do to build the kingdom (kin-dom). The other day, one of our young women explained to me that she was now talking with a young man that she has known since childhood, someone who really listened to her, although her family did not approve of this young man. It took me a while to decode that in her world talking with is the same as being boyfriend and girlfriend. When I thought about it, it made perfect sense, “talking with” is an act of intimacy, an act of trust, and an act that can grow relationship. Samuel needed Eli to become aware that God wanted to talk with him. Then, trusting Eli, he became open to this new intimacy with God. In the idioms of the Hebrew Scriptures, God found many ways to communicate with those chosen as prophets-to get their attention. With Samuel it was not as dramatic as a burning bush, but it was a call to conversation. No, he was not mentally ill and hearing voices or imagining himself in a grandiose manner. In his world he was simply open to hearing God in direct communication-in the light of the temple, near the Ark of God’s promise to be the God of the Hebrew people forever. To hear this holy call and receive this unique purpose and to grow in relationship and in imitation of Christ we do not need to sleep in the temple/church, like Samuel and Eli. But we do need to be temples of the living God, according to the Epistle reading (I Cor 6; 13-15,17-20). In being joined to Christ through baptism, we become one in spirit with Christ and need to live as if our bodies and lives are the temple of the Holy Spirit. God’s spirit within us can then guide us to hearing what God wants of us and what we can do to build the beloved community. For, as Martin Luther King,Jr. said and showed by his life, the purpose of our standing up for justice, including the use of nonviolent resistance to injustice, is to get to the next step of reconciliation, of building the community of love, justice and inclusion in the dream of a good life for all people.We recently saw the newly released film SELMA with some of our church members. While some critics (and there are always critics) say that the role of President Johnson was underplayed and actually not as negative as it appeared, other critics said that it was at least 90 percent the way it happened. We flinched and the tears came with each heavy and sometimes lethal blow the marchers and supporters sustained to win freedom and equality. It certainly was totally moving and accurate to the events and Dr. King’s philosophy of non-violence and community action-and the joining of blacks and whites and all people to gain the prize, not only of voting rights and human /civil rights, but the ultimate prize of building the beloved community. We thought of the recent lethal responses of both police and citizens in Ferguson,Mo. and in New York and how violence becomes the immediate answer to power struggles in this era. And we thought of recent events where violence and terrorism silenced expressions of free speech in France. While it is true that we need not inflame or be irreligious with speech, it is the sheer reliance on violence as the remedy for insult or offense that is tragic and appalling. And I think of our youth who are sometimes torn by friends and others who see the response to poverty and difference at the end of a gun, who “settle” real and imagined “beefs” with drive-by shootings that kill children and others who have nothing to do with any of it. They understand nothing of the courage it took to win freedom through non-violence, and they seem to have lost the essence of the dream. I don’t know how to win it back for them, but we can try. 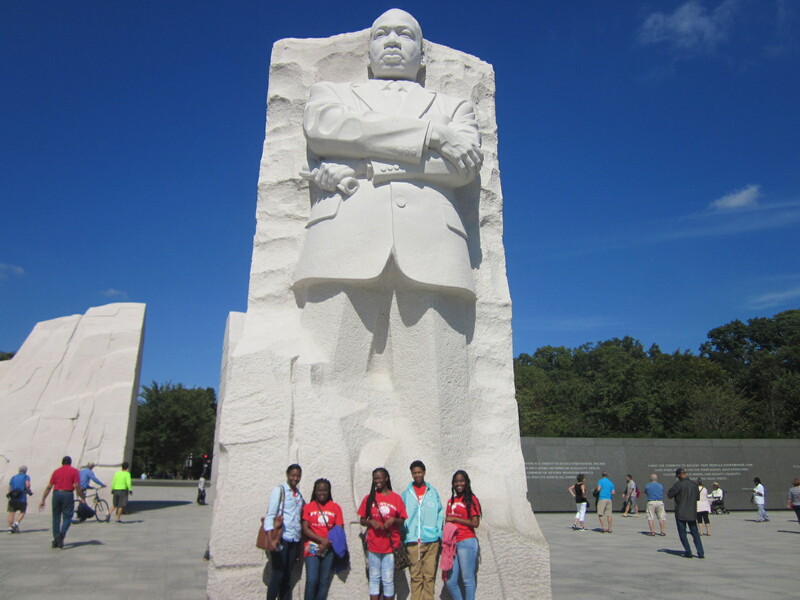 I also think of five of our young people gathered with us at the King Memorial in Washington DC loving and inhaling his every word about love and justice. Then, I feel hope. SELMA reminded us how successful non-violent responses can be, no matter the courage that is needed and the price to be paid in winning the prize. For the prize is reconciliation and not revenge, ultimately it is the beloved community, not the hateful community that will prevail. 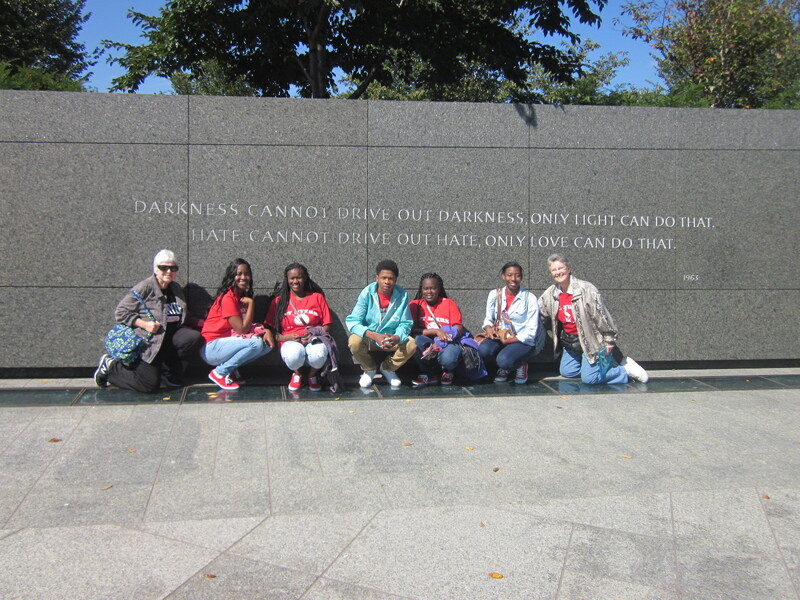 The Memorial wall below reads “….Hate cannot drive out hate, only love can do that”. This was the favorite King quote of our young people. “There is another element that must be present in our struggle that then makes our resistance and nonviolence truly meaningful. That element is reconciliation. Our ultimate end must be the creation of the beloved community”. “The aftermath of nonviolence is the creation of the beloved community, so that when the battle is over, a new relationship comes into being between the oppressed and the oppressor. To live the Gospel of Christ, the gospel of love and justice is not easy. As Mother Teresa of Calcutta said “Love is not words, it is action. Our vocation is to love”. And that is what call is all about. I know young and older people who have become missionaries to other countries and to poor communities in our own land, not only to share the words of the Gospel about God’s love in Christ, but to work hard with the people toward helping people in communities work together to get potable drinking water for all, and enough food for the hungry. Some do this full time and others for just weeks at a time, but all are working toward the reign of God. Some go under the sponsorship of a church or religious group, others take secular jobs and live in poor communities working side by side with the people. And those who cannot go may support those who do with love and prayers and material support. Our church is dedicated to working with the poor of this community and those better off toward reducing homelessness one person at a time, and toward feeding both physically and spiritually so that all may live. We try to hear the call of God together. Sometimes we get discouraged as the need is so great, but then we remember that all together we can do the job that no one can do alone. For us, it takes a village to raise a child and a community to hear and live the call of the Gospel. That brings us to the Gospel, John 1:35-42 where two of John’s disciples, one named Andrew ,at John’s own affirmative comment, seek to follow and learn about Jesus who asks them what they are seeking. They ask where he stays, and he says, “come and see”. I wonder if we can really see where Christ stays today? In the homeless camp, in the soup kitchens, in the midst of the violent ghetto, in the “war zones” of every sort, in the areas of life where violence and hatred seek to reign, in the humble churches where the faithful gather to understand the Gospel, with the doctors and nurses and teachers and preachers who serve the poor, in the matriarchs and other leaders of many strong and caring but poor communities, in the hearts of all people of all religions who seek to know and communicate with God. Down through the ages Christ invites us to come and see, Christ calls us to learn the Way. And when we find Christ, when we find the way, when we hear the call, the invitation, may we also be like Andrew who immediately went and got his brother Simon and brought him to meet Jesus, and run and invite our brothers and sisters to come and see this Messiah, the Christ whom we have found. This happens again in the remainder of the first chapter of John when Jesus sees Philip and says “follow me.” Philip in turn finds Nathanael and asks him to come and see this Christ. Nathanael doubts that “anything good could come from Nazareth” for The Galilee was an area of “hybrid” Jews living with other cultural influences. When Jesus meets Nathanael he remarks that Nathanael is a “true Israelite, in whom there is no guile”, in other words, a good follower of the Law. He then tells him he knows him from when he saw him sitting under the fig tree. In Aramaic idiom that means, I know you are a teacher of the Law, for many held classes under the leafy trees. Nathanael recognizes immediately that Jesus is the Christ, the fulfillment of prophecy, calling him the Son of God and the King of Israel. So Jesus lets both of these seekers, soon to become disciples, that he knows who they are, and he invites them to know who he is-to come and see. The Aramaic text is translated(John 1:42) “You are Simon the son of Jonah; you are called Kepa ( the Stone)”(Peshitta, Lamsa). Jesus is conveying here that he knows Peter, he knows what Peter is called, a nickname that means “more like “brick-headed” or “stupid” and he is accepting him just the way he is. So we are known and called by God, by Christ. We do not have to be perfect, we just have to respond, to get in the conversation, to join the dance, to respond to the call to live the laws of love and justice and to invite others to also come and see. May we have the courage to do this and thereby build the beloved community.